Petite Suzie is a 14 inch very limited edition baby girl doll by French artist, Malou Ancelin. This doll is cast resin sheathed in hand painted and detailed leather (lambskin). This very special medium is not a common find in the world of contemporary doll making, and appeals to the seasoned doll collector. Petite Suzie is #6 of a very limited edition of only 30 pieces. She has glass stationary blue eyes, and freckles. 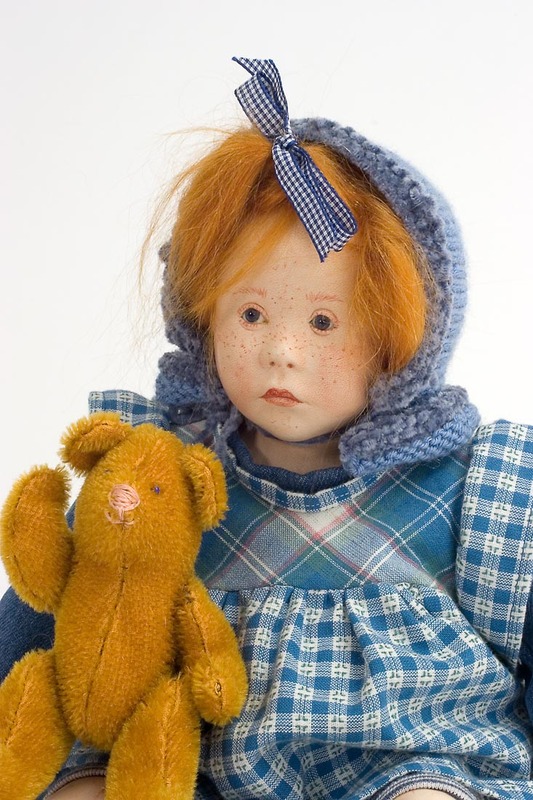 Her ginger mohair hair wig is caught up in the front in a whisky pony tail held by a blue gingham ribbon, and she wears a wedgwood blue knit bonnet to complement her blue pinafore ensemble and booties. Her mouth is closed. 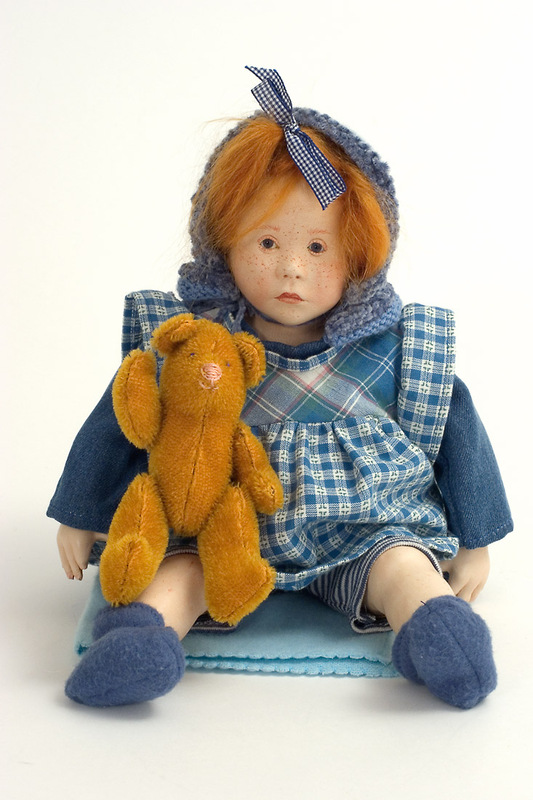 She holds a little 5 inch ginger mohair teddy with blue bead eyes and a pink embroidered nose and mouth. Petite Suzie is a charming example of this distinguished French artist's doll making technique, and is typical of her work from the 1970's and 1980's. Malou Ancelin is versatile in her artistic expression, and has branched out into other forms of art. She is no longer making these dolls, and they are a rarity. They have been exhibited in museums and art galleries across Europe and in America, including the Paris Museum.